Praises for outgoing Troutdale City Councilors Larry Morgan and Rich Allen didn't end when a celebration in their honor concluded. A special recognition event at the Troutdale Police Community Center, 234 S.W. Kendall Court, on Tuesday, Dec. 11, was followed by Morgan's and Allen's last City Council meeting as councilors. 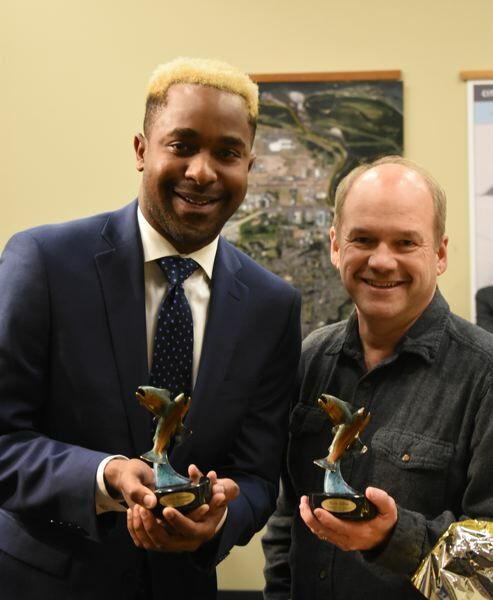 And two Troutdale residents took the opportunity to ensure their commendations were publicly recorded. Bruce Wasson, a Troutdale Budget Committee member, thanked the six councilors and mayor for building an environment where the elected officials can disagree on issues and still be amicable. He noted that Morgan and Allen helped create that cohesiveness. "At the end of the day (in Troutdale) you can sit down (together) and have a beer," he said. Diane Castillo-White also used the public comment portion of the meeting to thank Allen for his service. "Rich is humble, kind, fair and a man of integrity," Castillo-White said. "He is always positive, informative, mentoring — and leads by example." 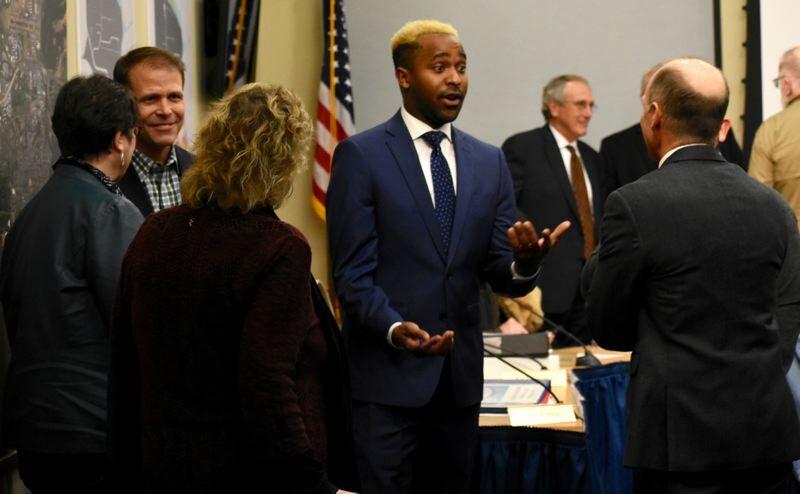 During the preceding celebration, attendees mingled with Morgan and Allen along with the mayor and the rest of the Troutdale councilors over coffee and cake. Citizens and councilors shared fond memories of the two outgoing council members. Councilor Zach Hudson said he met Allen during a panel endorsement interview at The Outlook in 2010. It was Hudson's and Allen's first attempt at gaining a seat on council in a contested five-candidate council race. Instead of Allen summing up everyone as competitors, he saw them as citizens who want to improve their community. "It would have been so easy to look at anyone else in that room interviewing and say, 'That's my opponent. How am I going to beat him?'" Hudson recalled. When Hudson was elected to council in 2016, he started working with Allen. "I always felt welcome by (Allen) even when we were running against each other," Hudson said. Allen and Morgan did not have to worry about campaigning this year, as they both opted to step down instead of filing for re-election. Allen will be replaced by Nick Moon in January. Moon won the November election race against Paul Wilcox and Deb Reuter. Morgan will be replaced by Jamie Kranz, who ran unopposed in the November election. Troutdale Mayor Casey Ryan thanked Allen and Morgan for their service. 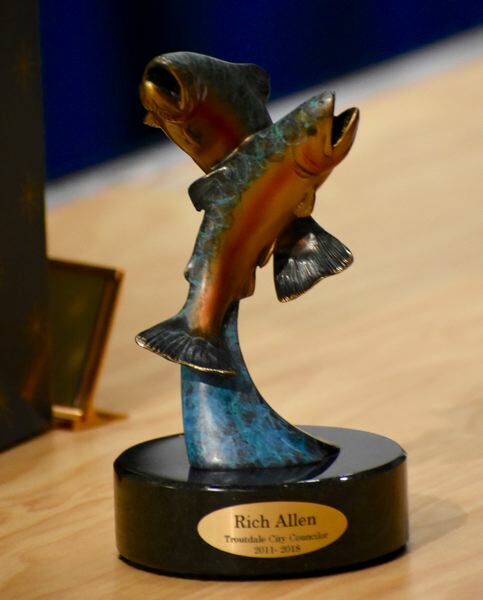 On behalf of the city, Ryan gave them both a small statue depicting Troutdale's logo of two fish jumping out of the Sandy River. Morgan has worked in community and political organizing. He is currently employed as the citizen outreach coordinator for the state of Oregon. Ryan said those work experiences, along with his time serving on local government, could mean Morgan, who grew up in Troutdale, is destined for a political career on a bigger stage. "Remember, you're a son of Troutdale," Ryan advised him in front of a packed room. "Run for office. You're going to have Troutdale's support."